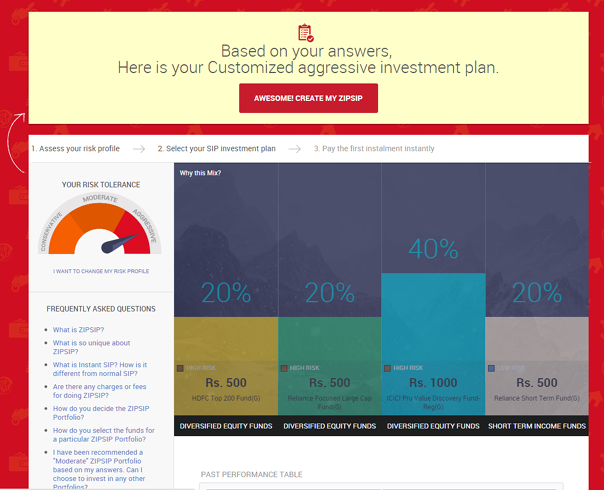 ZIPSIP is Mutual Fund Investment Platform by Aditya Birla Money – My universe. This platform helps you to make easy investment in mutual funds. ZIPSIP is for new investor who is eager to invest money in mutual funds but don’t know where to start from. Let’s review what is ZIPSIP and how it can help you? ZIPSIP is easy way to create mutual fund portfolio. You just need to do few clicks and system will generate mutual fund portfolio based on your risk profile. ZIPSIP is claimed to be backed by expert professionals. Visit Aditya Birla Money- ZIPSIP website. How much money you can invest per month? What action you will take If you face loss in money invested by you? Once you submit all information given above system will find out best mutual funds based on your risk profile. You can save your plan by providing your email id, name and phone number. What is Unique about ZIPSIP? ZIPSIP is fast, effortless and paperless. ZIPSIP provide suggestion about mutual funds instantly. You need not to spend number of hours to find out best mutual funds for investment. This service is backed by experts and mutual fund portfolio is suggested based on their experience and expertise. ZIPSIP is very good tool for new investors. This tool helps in selecting mutual funds, however there are few shortcomings. Minimum amount of investment using this tool is 2500 Rs/-. Investors are not allowed to shift from low to medium to high risk appetite. ZIPSIP allows mutual fund investment only as per output by tool. You cannot select and invest in any other mutual funds. No research paper or supporting document provided for selection of mutual funds. Looking at shortcomings in this tool, this tool is recommended only for first time or new investor, however you can use this tool to quickly find mutual funds that are appropriate for you. It is highly recommended to carryout research before making investment in any mutual fund. 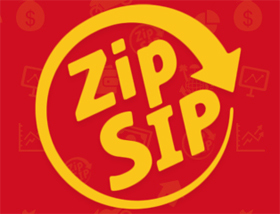 Do you use ZIPSIP for making investment in mutual fund? I am 28 years working women, I am a beginner. Want to invest INR 1500/- per month with moderate risk, moderate return. Pls suggest how to open SIP account and where to invest. You can invest in Balance Mutual fund which will provide you moderate returns.In order to open SIP you need to contact mutual fund house or brokerage house. I WISH TO INVEST 1000rs PER MONTH , FOR 36 MONTH , WHAT COULD BE THE GAIN ,IN zipsip. You can expect gain of 10-12% in good mutual funds.